Unless you live near the Arctic waters around Greenland, Canada, or Russia, it is unlikely that you’ve witnessed a narwhal firsthand, but even pictures of these strange beasts are capable of eliciting fantastical thoughts. Appearing very similar to the white beluga whale, one immediately obvious distinction is how the narwhal possesses a large spiral “tusk”, which is actually a canine tooth that projects from the left side of the upper jaw, through the lip, and forms a left-handed helix spiral. But this reality didn’t prevent early interpretations of the narwhal from depicting it as having a horn emerging from its forehead, garnering it the nickname the “unicorn of the sea”. And while various legends have arose to explain this distinct feature, the husband-and-wife artist team of Dan and Kozue “Kozy” Kitchens, jointly referred to as Kozyndan, have evolved a theory of their own. Kozyndan’s interest in the narwhal first became apparent when the duo revealed a depiction of the beast spearing a human on its horn, created as part of their celestial cover illustration for Adventure Time‘s sophomore album, Of Beyond. And while the recording wouldn’t be released until 2014, the artwork was produced around mid-2012. A foreshadowing of things to come, this piece led the way for their Rainbow Narwhal Spirit Animal poster to be issued in November that year. Imbued with their whimsical sense of magical realism, this rendition revealed the secret evolution of the narwhal, exposing a unicorn hidden within the beast’s belly, it’s iconic horn piercing through the whale’s head to create the creature’s overall appearance. But Kozyndan’s fascination with this concept didn’t end there. They created the full-color Celestial Bodies print, debuting it as part of PangeaSeed‘s Sea of Change: The Year of Living Dangerously – Vol. 2 collection in February 2016. Then, the following month, the original graphite illustration of this design was displayed under the title Magic Tribe in their 2016 solo exhibition Liquid Samadhi at Australia’s Outré Gallery. But these examples aren’t the full extent of Kozydan’s exploration of this idea, as back in 2012 there was also a series of three-dimensional renderings. For their fourth solo exhibition at Canada’s Narwhal gallery, the duo of Kozyndan formulated a nuanced, visual ode to the animal kingdom. An exploration of the reverence mankind has for these beasts by incorporating the myths we’ve formulated about them into the works, the mid-November 2012 opening of this Breaking Circles, Broken Light showcase appropriately featured the debut of their Rainbow Narwhal Spirit Animal poster. 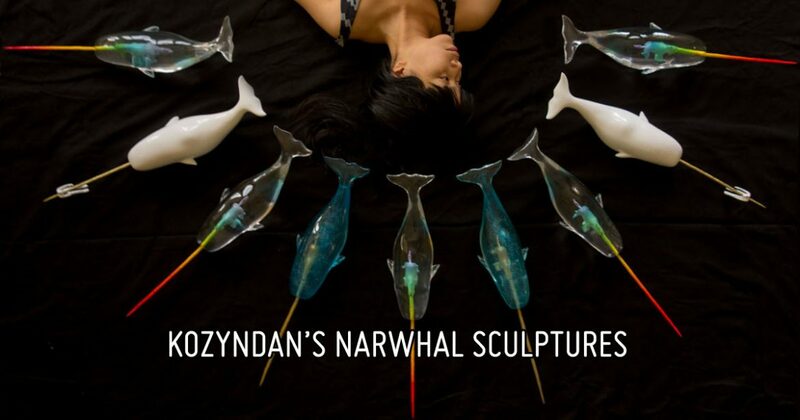 Furthering their own legend regarding the narwhal’s origins, this two-dimensional work was accompanied by several editions of a sculptural interpretation. With each finished sculpture hand-fabricated by Julie Beezy and her Pretty In Plastic studio, the first half of this two-part creation was the roughly 14½-inch long whale body. Making a mold from the finished master sculpt, this aspect was cast in ultra-clear resin around the internal unicorn element, whose horn extended approximately 10-inches from the narwhal’s snout. And heralding back to Kozyndan’s Of Beyond album artwork for Adventure Time, a speared human was also created, its removable form only appearing on a handful of the finished narwhal sculptures. Issued at the exhibition in five different color schemes, each limited to an edition of 8 pieces, there was discussion at the time that further renditions may be issued but, to date, no new manifestations of this magical beast’s sculptural interpretation have been spotted in the wild.